Ecotopia Research Papers examine a fictional account of the secession of the western states from the United States, and how it related to political science. 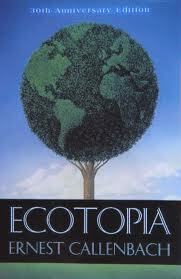 Ernest Callenbach published Ecotopia in 1975. The premise of Ecotopia is that California, Oregon and Washington have all seceded from the rest of the country in 1980 to form its own country based on ecological and utopian principles. The book's form is combination of notebooks and reports from William Weston, a fictional journalist who is the first to visit Ecotopia since its secession. We learn early from Weston's diary that the "secessionists filched uranium fuel from the plants for the nuclear mines they claimed to have set in New York and Washington". According to Weston, the Ecotopians political organization was led by women, who "managed to paralyze and then supplant the regular political structure, and got control of the armories and the Guard". In addition, his diary claims that Ecotopia is very isolated, with no phone or wire service, and a relatively primitive form of government control that is typified by police aren't even armed. Weston's specific assignment is to explore all aspects Ecotopian life for six weeks. During this time, he hopes to describe how Ecotopian society actually operates, with hopes of finding a way to reunite Ecotopia with the rest of the country. Marked differences between Ecotopian life and the traditional American life are immediately noticeable. When Weston crosses the border he is informed that he is lucky the wind is blowing west or they may not allow his internal combustion taxi to take him twenty miles to train station. They confiscated his gun and explained that no concealed weapons are allowed in Ecotopia. Weston characterizes the people he meets in Ecotopia as friendly, loose, and appearing like old time westerners from the gold rush days. They smoke marijuana freely, build houses from all sorts of different materials and allow natural vines and bushes to cover their homes. In San Francisco, Market Street had been mostly planted over with trees and gardens, and transformed into a two-lane street on which electric taxis and mini-busses "purred along." The busses and street maintenance were both paid for out of a general tax fund, like many other public facilities. Ecotopians differ in many essential ways from citizens of the eastern U.S. Weston notes that they seem eager to spout statistics and introduce social costs in to any conversation. They also have certain technological advantages, such as picture-phones, which Weston claims are much better than the ones to which he is accustomed. There are also scenes in Ecotopia that may appear in any city in the eastern U.S. For example, Weston notes a group of street musicians gathered to play Bach, with food vendors pushing their carts and jugglers performing for children. Paper Masters writes custom research papers on Ecotopia and examine a fictional account of the secession of the western states from the United States, and how it related to political science.